Its time to bust through the ceiling. Whether it's the glass ceiling, the bamboo ceiling or any other barrier to the success you want, it's time to break through. We've all been there. You see that guy with the fancy dental work, the $300 blue jeans and the oh so confident air get the deal, the gig, or the position you've always wanted. And it makes you SO ANGRY. But what if you could learn the secret skills to be seen as the power broker, the winner and the number one candidate? You can with POWER NETWORKING. 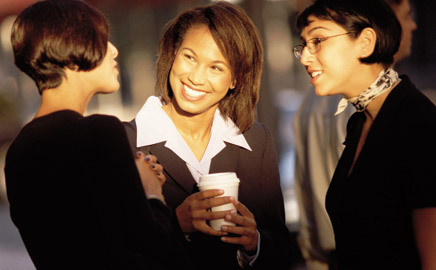 In this hands on networking session you'll learn to look, sound and act like a million, no a BILLION dollars. Stop worrying about sounding smart and start making your others feel smart. If you ever searched 'what is a CTO?' you will find article after article filled with buzzword after buzzword like synergy, innovative, collaborative and other subjective words. But what exactly is your role? Why as a start-up or small to mid-sized company is this role so hard to fill? Who should they really be reporting to, The CEO or the Board of Directors? If you are a CTO do you feel like sometimes you are talking to the preverbal "brick wall," that your words are just not getting through? Come participate in this CTO workshop where I demonstrate tools and tricks to help you bridge the gap between STEM world and the Business world. Be BOLD, Be STRONG, Be YOU! In a year with sexism, sexual harassment, and questioning the abilities of women in technology, it's important to recognize and celebrate women in technology and encourage more women to join the technology fields. Women continue to be underrepresented in the field with only 25% of the Technology workforce. In order to move the "needle" we need to provide support and encourage confidence in women to join the field and advance their careers. WITI is a community of strong professional women to learn and grow from so you can gain confidence and succeed in the technology field. Come celebrate with us at our first Annual Celebration of Women in Technology and be a woman that represents women! We will be holding a silent auction with all proceeds benefiting Child Crisis Arizona. Child Crisis Arizona's mission is to provide Arizona's children a safe environment, free from abuse and neglect, by creating strong and successful families. Come join us for an evening of making connections! Appetizers and drinks will be served in the Private Bar area. In a world more connected than ever before, there is a stronger focus on consumers and their cyber safety. October is National Cyber Security Awareness Month. Join the conversation where we will discuss cybersecurity risks, IoT and keeping data safe by sharing tools and best practices to help us stay safe online. Together, we can help make the cyber world more secure! Join us for this highly-interactive workshop! Come join us for one of our premier events of the year....CXO Mentoring Circles! Spend an evening with CXO level executives in an intimate setting as you rotate through three 20-minute sessions along with 8-10 attendees per executive circle. Topics range from career coaching, budgets, project schedules, outsourcing, or any number of other subjects. Members can win a personal CIO mentoring hour. Join WITI Phoenix for a fun evening of Cocktails & Connections! No panel discussion tonight, bring your business cards and come out and meet the other tech and life sciences professionals in the Phoenix community. Successful ways to handle change at home, work and everywhere else! This workshop will discuss automated methods for discovery, clean up and prevention of loss. Attendees will be given a worksheet that assists in identifying the data that automated tools just can't find - however, if it got out - would hurt your company, your employees or your shareholders. "Systems thinking" is being called the top skill required for being successful in the 21st Century. As the world becomes more and more complex, so do the situations we face. In order to navigate the roiling waters of change, we must be able to clearly and deliberately make decisions. Sustainable, lasting decisions can only develop if we are able to look holistically and understand how the parts of a situation interact. Systems Thinking surfaces cause and effect links and loops to provide a different perspective and a new way to communicate. Join us for Happy Hour to celebrate Women In Tech, network with some great people and learn about our exciting workshop lineup for 2017!